*No mileage available. 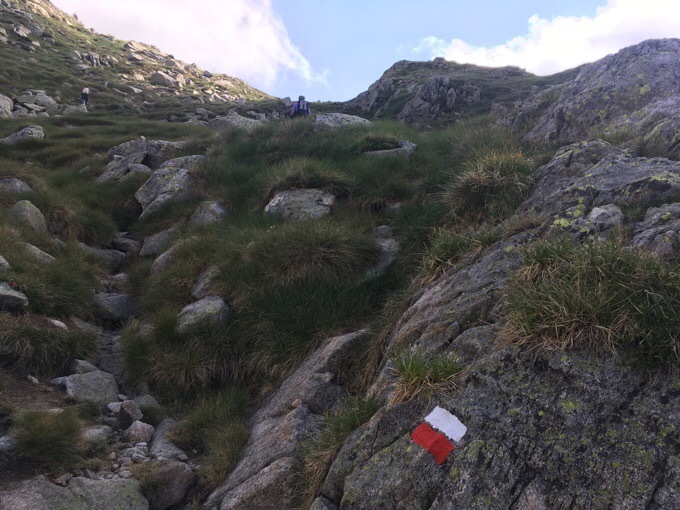 The guidebook lists distances on the route by time rather than miles. ﻿Paul and Chantal drove me the hour back to Hospital De Vielha for the second morning in a row. This time, the weather was much clearer, and with it being a Saturday, there were 25 cars in the parking lot. There are many hikes that leave from this trailhead. 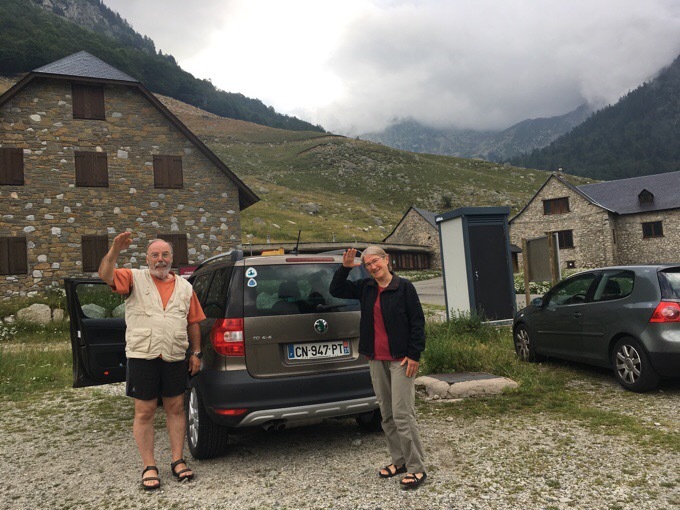 Just after 9am, I bid farewell to Paul and Chantal, who were amazing hosts. I will see them tomorrow when I reach the town of Salardu. Since it is Sunday, and the supermarket will close before I arrive, they are bringing me my resupply for a 7 day stretch. They will conveniently be out there to pick up Why Not and Jim, who will be arriving where I started off today. All make sense? Bye Paul and Chantal. Hard to see, but upper left by the roof tip, those are not rocks, it’s a herd of sheep. Today was the perfect way to ease back into the trail. A relaxed day, with much less intensity than the previous week or so. 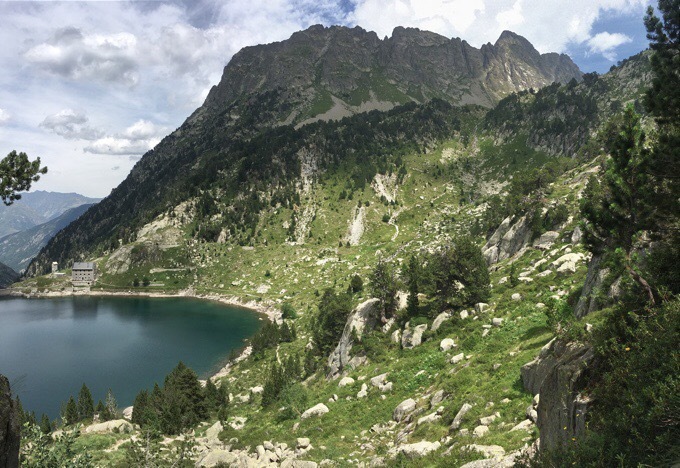 It started off with a 2hr climb on the GR11 that wasn’t too steep up to the large lake, Estany de Rius. The whole day reminded me of the Sierra Mountains in California both in scenery and terrain. It was awesome to get some time along lakes today rather than the long climbs and descents from one valley to another that had become the pattern. Not that it isn’t gorgeous, but it’s nice to get a break from that and be somewhat level for awhile. 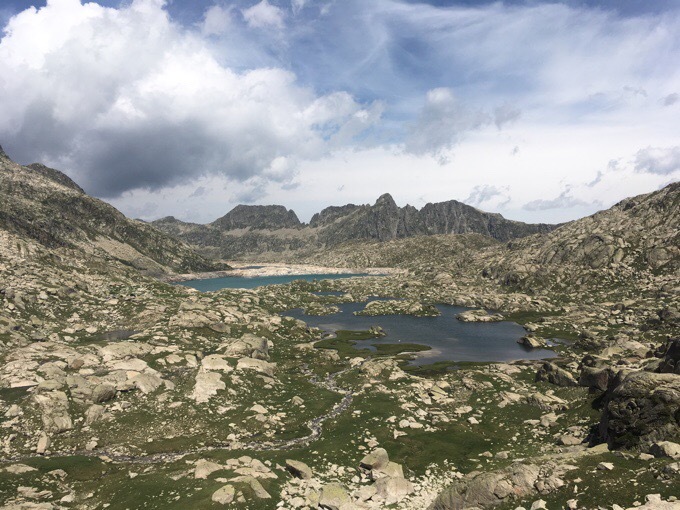 At the end of the Estany de Rius, the HRP turns off the GR11 and does some extra meandering over a pass and to some lakes for the remainder of the day until returning to the GR11 at a refuge. HRP in light blue, GR11 in dark blue. Had I been out here yesterday in the foul weather, I would have been quite tempted to cut the meandering and head straight for the refuge. I’m so glad I didn’t and that I waited to hike today because it was a great section to be able to enjoy in beautiful weather. 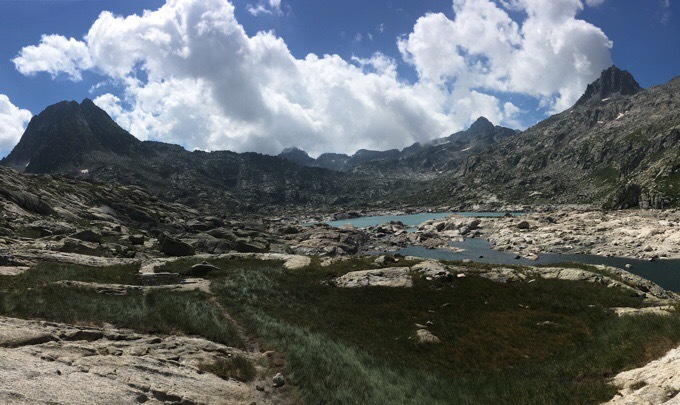 Hiking along lakes to the next pass. However, my body was not cooperating today. I didn’t get a good night of sleep last night. My body is pretty quick to adjust to my energy output. If I don’t do enough during the day, it isn’t tired and also isn’t as hungry. After two days of rest and food, I found myself too energized to sleep last night and too full to want food today. My stomach oddly hurt the more I hiked, but I brushed it off as just needing to burn off some of the stored food I’d built up and the fact that the winding roads out here made me car sick. Looking back once I climbed up. 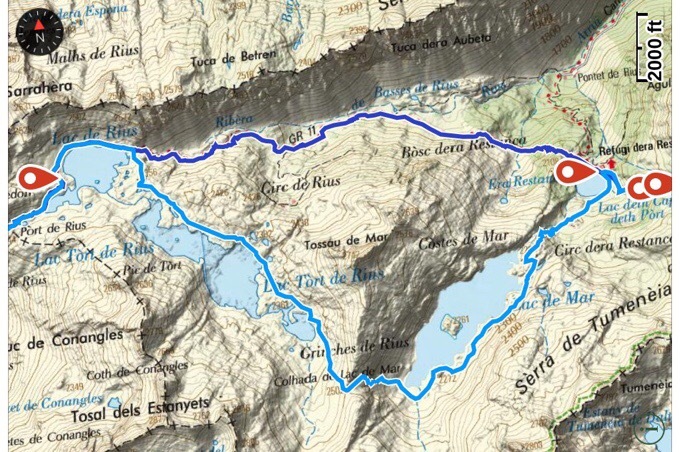 Just before lunch, I hit the Collado d’Estany de Mar. 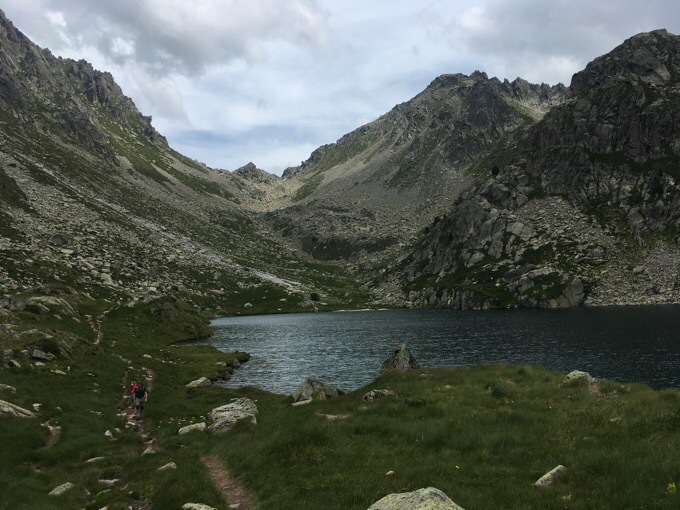 I had seen many day hikers on the way up to the first lake, but once off the GR11, I didn’t see anyone on the cairned section up to the col until I got to the top. 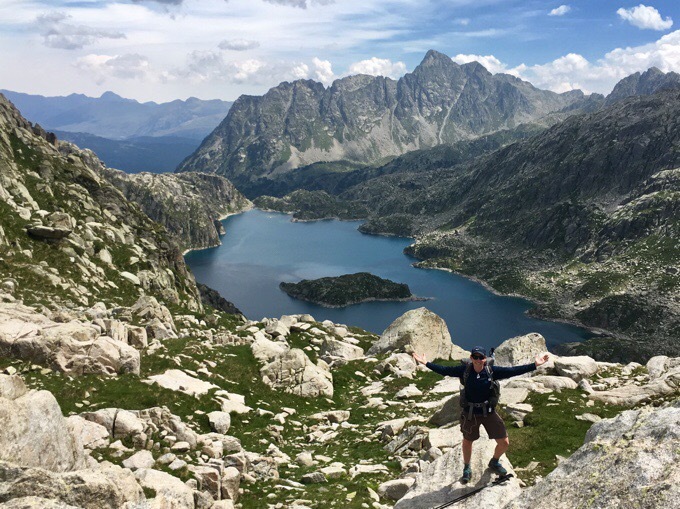 A group was up there and I was able to get a photo of me with the awesome view of the Estany de Mar. The color was cool and changed with the sun. It had an island in the middle and made me think of Crater Lake. I continued down away from the group and found a nice spot overlooking the lake to eat lunch. Even though I wasn’t hungry, I forced it down knowing I needed fuel for the day. Another large group hiking up came by and a guy from England talked to me. He said they are on a guided trip where they do three days of hiking in a row to cool destinations out here and go back to town to sleep in a hotel each night. Not too shabby! He said yesterday they were on the French side and managed to dodge the storms, but they were super close and the thunder was so powerful it shook the ground. Yeah, I’m glad I didn’t hike yesterday. 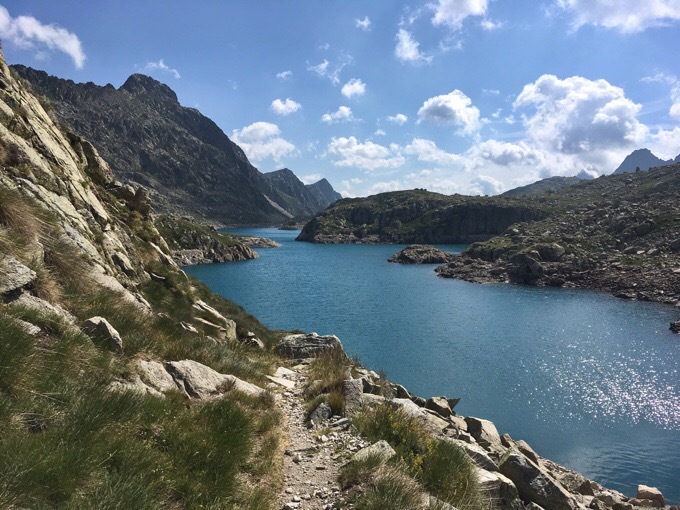 After lunch was the descent down to the Estany de Mar and then some rocky grassy terrain that was a little slow going to the other end of the lake. When I got up from lunch and headed down, my stomach ache was gone, but I was really lethargic and dizzy. So bad that if I closed my eyes while standing up, I’d lose my balance. What the heck!? It felt hormonal with the full body impact, so I checked the calendar, but I’m in the clear on that for a bit longer. I tried to think of what it could be. Elevation? I wasn’t that high (7000ft/2100m). Lack of sleep? Still car sick? Actually sick? The only thing out of the ordinary for me was that two days ago at Paul and Chantal’s I hit my forehead really hard on a pole at their house that seems to be a common spot for that to happen. No bump or bruise, but my forehead is really sensitive to the touch still. Maybe it’s from that? I hit it really hard, and maybe I didn’t notice cause I hadn’t been active. Whatever it was, I was happy that I had a relaxed day planned for today and just a few more hours of hiking that wasn’t too difficult. 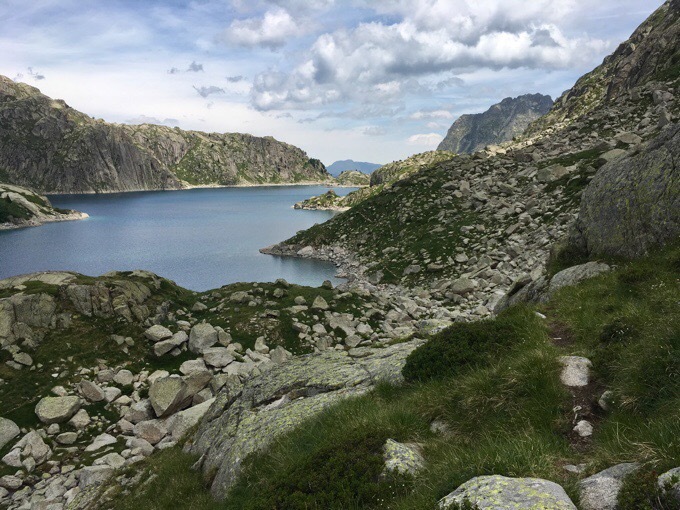 Once at the end of the lake, there were switchbacks down to the large Refugi de la Restanca, which sits on another dammed lake. Heading down to the refuge. Notice switchbacks heading up that would be where I’d head to camp. When I got there, I was well ahead of schedule for the day and took a bit to sit down before my final climb. There is limited camping in this area, so I knew I had to stop at the next lake to legally camp even though it would be an early day for me. I was totally welcoming the earlier camp time! The pass I will go over tomorrow morning. 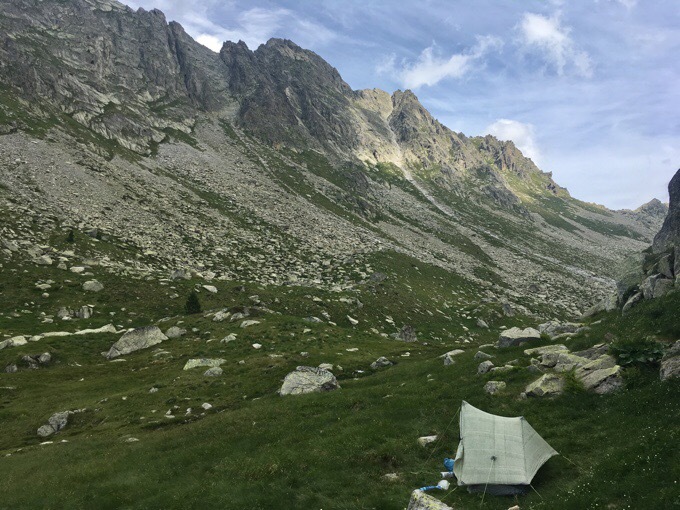 Once up to the Estany deth Cap deth Port, I found a nice hidden spot that had been labeled on the track I have from 2010 HRPers, Amy and Jim. It’s a perfect spot! Just on the other side of a rock wall totally out of sight of all the day hikers since this is a very popular destination and it’s a Saturday. Also, it is well protected from the wind as it’s quite breezy with gusts from time to time today. I’m not sure, but there may be a slight chance of overnight rain, so I setup for that just in case. It was 4pm when I arrived. I immediately put the tent up and laid down inside without even getting my sleeping pad or bag out. It was super comfy on the grass, or I was too tired to care. I took a 15min nap before I was motivated to do the rest. I had my pajamas on before 5pm. It felt awesome to be laying down! It was chilly with the wind, but the tent was warmed perfectly by the sun, and I was oh so comfy in my sleeping bag. I did my blogging before dinner and took a 30min nap until I finally got hungry. I had everything done by 8:30pm, watched some shows, and am going to try to sleep early. Hopefully, I’ll be refreshed tomorrow. Love the views. What a wonderful area to see. Hope you feel better. 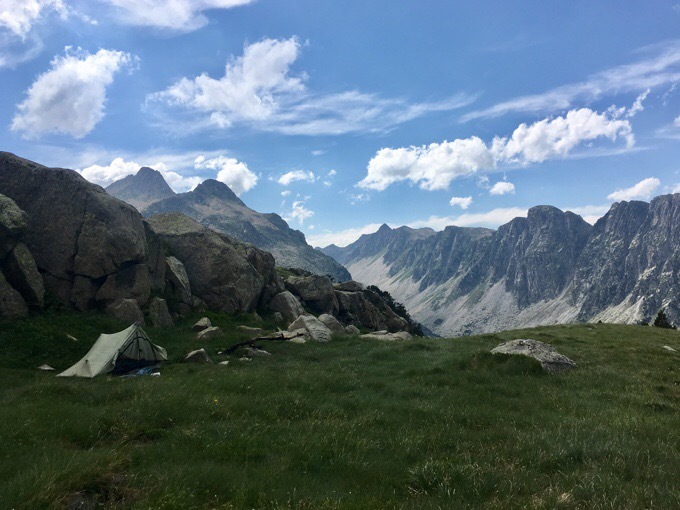 I stayed at Refugio Restanca – the nicest and friendliest of all the Spanish refuges I went to. The whole area is lovely. Nice, but hope the head bump isn’t a problem. I will miss Paul and Chantal.. Well you have one more meet up. Haven’t had a notice of an update to Why Not’s blog lately.. But will look forward to those when they arrive. That looks to be a heavenly camp spot. Some of that feeling dizzy–sounds like vertigo. Yeah, I thought of that too. Gorgeous! Wow, I’m so happy you waited out the lightning! I hope your symptoms subside and wish you health, my dear friend! So beautiful. I hope your dizzyness passed and your are A-OK now! What a “perfect” welcome back to the trail (except the dizzy part). 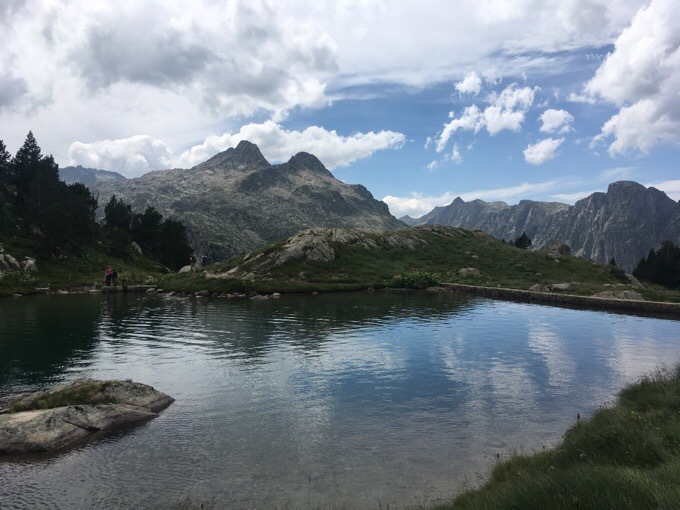 Hi Erin, I’m the english guy you met on the col de Lac de Mar. Just got round to having a look at your blog. I got a couple of photos of you on your rock above the lake. I can send them to you if you are interested.